Under Armour were preparing to unveil a new range of water-resistant Storm wear designed for athletes to wear in the winter. The clothes feature a dynamic water repellent finish that should mean the fabric won’t get clogged up and heavy with water and will dry up to five times quicker than your standard cotton fare. The new range includes hoodies, jackets, trousers, and leggings. 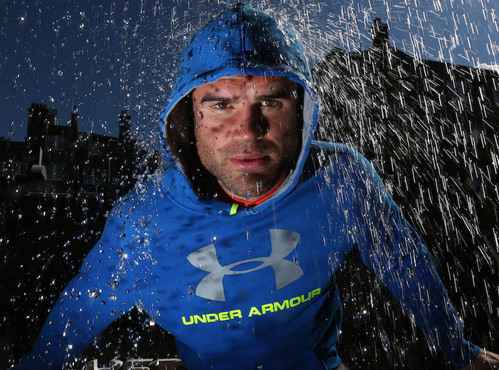 The brief was pretty simple, Under Armour wanted to showcase the water proof features of their new range using one of their high profile ambassadors, in this instance Welsh Rugby Union star Jamie Roberts. The challenge with water photography is the visibility and making sure it really stands out. There are three ways to overcome the visibility issues, large volumes of water, dying the water, or shining light on the water. The camera men generally like to control the light themselves and have plenty of equipment to deal with this factor. Dying the water can cause staining and it’s hard to get the right shade of colour. It can also cause staining, so our team opted for the lots of water route. We travelled to London for the photoshoot, set-up a truss goalpost and rigged a high volume Rain Effects Bar onto it. This would enable us to drop water from above Jamie, without any of the structure featuring in shot. The thick sheet of water fell and Jamie stepped directly into its path. Great shots were achieved for the promotional stunt. But most importantly, the under Armour Sports wear kept Jamie dry.